Profile: The pieces I design and make to be worn must be very useable and comfortable. This is the key for me. People often say things like, I never take them off, and I take that as the greatest compliment. Showing them to the world pales to insignificance, the real kick is in becoming attached to them. Someone once described my work as rootsy but urban, classy but understated. If thats so, it migh be because I was brought up between the city and the country. It might have something to do with being from Brazil, a country often described as a land of contrasts, a place of extremes. 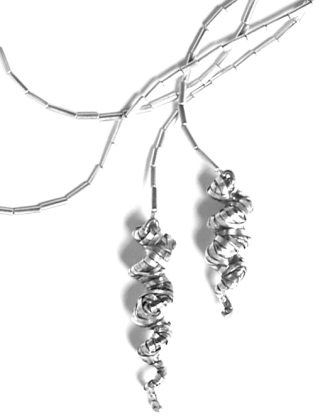 Another commentator said my pieces made from interlaced silver and gold ribbon reminded them of the social fabric of Rio de Janeiro, a city where strands of wealth and poverty, ethics and violence, culture and corruption are constantly intertwining. The middle is a place of constant friction: where the challenge is. And, through the creating and making process I strive to reach, even if momentarily, a place of balance.